While we have discussed the benefits of a Revocable Living Trust, it’s interesting that most Americans do not have a simple will as part of their estate plan. You might believe that a will is only for the rich and famous, and not the average person who has a far smaller net worth. On the other hand, you may think that a will is entirely unnecessary since you have a trust, jointly owned property, or have named beneficiaries on your insurance. Furthermore, when a person dies without a will (referred to as intestate), the estate goes into probate. Probate is a judicial proceeding by which the court decides the rightful heirs and distribution of assets of a deceased. Going through probate can be both more time consuming and expensive without a will than it is with a will. This is because your will can waive certain probate requirements (like having the executor post a bond or obtain judicial approval to have an estate sale). At the same time, probate without a will follows Georgia’s intestacy laws which may likely result in a less-than-perfect split of assets that not only may not be in line with the deceased’s wishes but may leave many surviving loved ones unhappy. Consequently, for many reasons the creation of a will can fill in gaps of property assignment or plug holes in beneficiary claims on life or other insurance policies. Family dynamics also play a part in estate planning, something Georgia’s intestacy laws do not account for. Many people have blended families. There may have been second or third marriages. Older couples may choose to cohabitate after a death or divorce and never legally get married. You may have to treat your children differently on current accounts due to distance, and without a will, those assets will not be distributed fairly. It is important to note that a will can also include a no contest clause (called the “poison pill” provision), reducing the likelihood that potential heirs will argue over its contents, something that simply isn’t possible if you don’t make a will. Creating a will as part of your estate plan is primarily about passing your wealth to your loved ones after you die since a will only “works” after it’s gone through the probate court process. It really is about giving you both independence and control of what happens to your assets after your death. Instead of leaving the distribution of your property to Georgia’s intestacy laws, a will can put your wishes down on paper and direct a selected person to carry out your desires exactly as expressed. 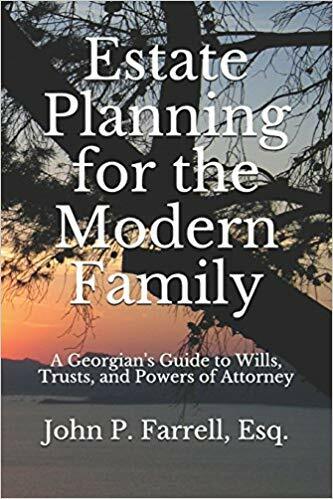 If you need help with a Last Will and Testament, give us a call at (678) 809-4922 or get our book, Estate Planning for the Modern Family. Next Next post: How do I share heirlooms with my family?